IFA 2014: 4K and curved OLED sets among Haier's new TV ranges | What Hi-Fi? Chinese home goods manufacturer Haier has announced the launch of its new range of TVs, which include curved OLED and 4K UHD variants – as well as an upgradeable modular model. The modular TV from Haier (pictured) could be a handy fit if you're someone that wants to keep up with the latest technology, but would rather not fork out for a new set each time. While Ultra HD 4K TV content is pretty scarce, it might not seem feasible to buy a 4K-enabled screen. With Haier's new TV, customers can purchase a 1080p set but upgrade the panel to 4K when that content becomes more readily available. 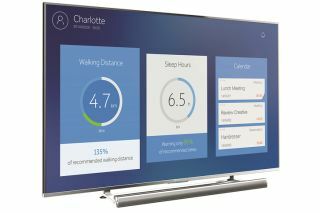 Other connected TV features can be regularly updated to keep up to speed with the latest technological trends, while the TV also comes with a range of health monitoring feature built-in. That means you'll be able to connect and sync smart health sensors on your smartphone and wearables, before viewing the information on the big screen. An integrated camera advises the user on the optimal viewing position and an alarm sounds when the viewer gets too close, has poor posture or watches TV for too long. Brightness levels can also be adjusted automatically. Meanwhile, the 65Q8000 curved 4K Ultra HD LED TV will come in at 65in and feature the company's own smart TV platform, 3D capability and dual tuners. A 100Hz refresh rate and 40 million:1 dynamic contrast ratio complete the tech specs. Elsewhere, there's built-in wi-fi, two USB ports, HEVC decoding for 4K streaming, three CEC (Consumer Electronics Control) and ARC (Audio Return Channel) HDMI ports, one HDMI 2.0 port, headphone jack and a PC input. Sound comes courtesy of two 10W loudspeakers. The Haier 65Q8000 will be available from the first quarter of 2015, although pricing details have yet to be announced.